OKO Mining Xtra Heavy Duty is an essential aid to operators of vehicles that suffer the very harshest off-road terrain. Fitting tyres with solid polyurethane fill is one solution but it carries a heavy weight penalty, is very expensive and adversely affects the ride, as well as placing a strain on axles. In most cases, extra heavy-duty OKO Mining can work as well as solid fill, at a fraction of the cost and with minimal weight penalty. It seals holes of more than 20mm in diameter in tubeless tyres. That is why it is the natural choice for mines, quarries, waste management plants and rough construction sites. Norilsk Nickel, the world’s biggest nickel mining group and one of the biggest all-round mining corporations, has tested and officially approved OKO Mining for use in its vehicles after extensive summer and winter testing (down to -52 degrees C). In underground Chilean mines, tyres that normally last only 5 months had their life extended to 7 months by the use of OKO Mining. This is due to its beneficial effects upon tyre porosity, tyre cooling and conditioning of the rubber. Britain’s biggest housebuilder specifies only OKO Mining, for use on all its construction sites, following a competitive assessment of other tyre sealants. A Canadian forestry truck operating on harsh trails, fitted with tyre temperature sensors, recorded a 11.5% average reduction in temperatures on its OKO-fitted tyres compared to matched non-OKO tyres. Heat is the greatest cause of premature tyre wear. OKO Mining is primarily designed for use off the highway. It can be used on road for slow-moving on/off road trucks and service vehicles, and is often used in countries with bad road surfaces. 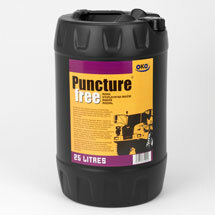 The black 25 litre drum is used in combination with a NEW durable all-alloy pump (sold separately), which delivers up to 250ml (adjustable in 50ml steps) per downward stroke for rapid and accurate filling through the valve stem. Our specially-designed pump works against pressure, so you can inject OKO into tyres containing up to 60 psi/ 4.1 BAR. It is far superior to competitors’ pumps that are usually plastic or rust-prone mild steel, may require you to assemble them, have a lower capacity and pressure stability and often lack a shut-off valve at the nozzle. Because OKO is water-soluble, the pump washes clean for repeated use, and if the tyre is removed from the rim in the future both the tyre and the wheel can be hosed clean. Anti-corrosion agents prevent any damage to either. Many users of very large mining tyres pour the sealant directly into the tyre well (either in the full 25 litre quantity or via decanted 5 litre jugs) having mounted one tyre bead on the rim: then they simply seal up the second bead. Precise calculations depend on the tyre size and type but typically OKO can be fitted to all 4 large industrial tyres for much less than the cost of replacing one tyre, even using a remould. QUANTITIES: see the Dosage Calculator on this page.